We’ve seen how type­writer habits have re­tained a pe­cu­liar in­flu­ence on the ty­pog­ra­phy of to­day’s doc­u­ments (e.g., re­search pa­pers). These habits arose from the me­chan­i­cal lim­i­ta­tions of the type­writer. When the type­writer dis­ap­peared, so did the lim­i­ta­tions. But the habits re­mained. De­tached from their orig­i­nal jus­ti­fi­ca­tion, they’ve be­come point­less obstructions. Tiny point sizes for body text. Huge point sizes for head­ings. Re­liance on a small hand­ful of sys­tem fonts, like Ar­ial, Geor­gia, and Ver­dana. Page edges crammed with in­scrutable wads of nav­i­ga­tional links. Lay­outs built with large blocks of color. We must set these habits aside, I im­plored. Though even then, I thought it would amount to yelling at clouds. The cargo cult was entrenched. To­day, the last ma­jor pro­po­nents of ’90s web de­sign habits seem to be e­Bay and Amazon. In par­tic­u­lar, af­ter spend­ing decades as a font-free zone, it’s been cheer­ing to see sys­tem fonts largely dis­ap­pear from the web. True, many of the re­place­ments are ques­tion­able free fonts, es­pe­cially Google Fonts. But it’s a process, right? Cer­tainly, I see a lot more Char­ter than I used to—that, I’ll take credit for. Why has the tide risen? For a long time, web de­sign kept it­self in a state of nei­ther here nor there. Like the poor worker of proverb, it was eas­i­est to blame lack of progress on the tools. If you asked a web de­signer “why aren’t we do­ing bet­ter with web ty­pog­ra­phy?” you were likely to hear ei­ther “we can’t, be­cause such-and-such won’t work in the old browsers” or “we can’t, un­til such-and-such works in the new browsers.” These ex­cuses kept web de­sign in a bub­ble, con­ve­niently im­per­vi­ous to criticism. Browser mak­ers have adopted a faster tempo of ma­jor up­dates (mostly chas­ing Google Chrome, cur­rently the dom­i­nant web browser). This pol­icy has dri­ven out older ver­sions faster, mak­ing back­ward com­pat­i­bil­ity less of a hobble. With ty­pog­ra­phy, every ma­jor browser is now ca­pa­ble of pro­duc­ing so­phis­ti­cated layouts. I’ll go one step fur­ther: I pre­dict we’ll no longer see ma­jor in­no­va­tions in browser lay­out tech­nol­ogy. What we’ve got to­day is likely as good as it gets. HTML/CSS tem­plate sys­tems like Boot­strap have smoothed over the com­plex­i­ties of mak­ing pol­ished ty­po­graphic lay­outs, in prin­ci­ple free­ing de­sign­ers to think about de­sign rather than fid­dly tech­ni­cal details. I say “in prin­ci­ple” be­cause, as of­ten hap­pens with ad­vances in de­sign tech­nol­ogy, de­sign­ers have not in fact used tem­plate sys­tems to broaden the web’s de­sign hori­zons. On the con­trary, tem­plate sys­tems have sim­ply ac­cel­er­ated the adop­tion of a new cargo cult of de­sign habits. Sure, page by page, the web looks bet­ter than it did 5 or 10 years ago. But at the cost of be­com­ing more ho­mo­ge­neous. We swapped ugly for boring. Trends rise and fall in all ar­eas of de­sign, of course. Web de­sign­ers, how­ever, have tra­di­tion­ally been more sus­cep­ti­ble to look­ing lat­er­ally for ideas & in­spi­ra­tion, be­cause it’s so easy to do. For in­stance, re­mem­ber all the sites that put a video back­ground on their home page? Gone a year later. Or when every­one used the 960 grid sys­tem? Also gone. Or to­day, all the sites with a “ham­burger” but­ton atop a full-bleed stock photo? (Doubt­less an homage to Ap­ple.) Tem­plate sys­tems pack­age these trends into freely down­load­able themes, ac­cel­er­at­ing the lurch from one cargo cult to the next. Against that back­drop, my ty­po­graphic ad­vice for web­sites is more a prin­ci­ple than a prescription. To con­vince you to aban­don the type­writer habits in printed doc­u­ments, I’m able to cite a per­sua­sive body of ev­i­dence: namely, the pro­fes­sional habits of the books, news­pa­pers, and mag­a­zines we read daily. Af­ter 500 years of ty­po­graphic prac­tice, not every wheel needs to be reinvented. The web, how­ever, has no equiv­a­lent tra­di­tion. We can’t fill this gap merely by hold­ing the web to print tra­di­tions. That would be lim­it­ing and il­log­i­cal. But it’s equally il­log­i­cal to refuse to com­pare the web to any bench­mark on the grounds that it’s sui generis (be­cause it’s not—the web is pri­mar­ily a ty­po­graphic medium), or that it’s new tech­nol­ogy (be­cause it’s not—the web is 25 years old), or that it’s still evolv­ing (be­cause that’s true of every tech­nol­ogy, in­clud­ing print). Browser lay­out tech­nol­ogy has prob­a­bly reached its peak. But that means web de­sign is just get­ting started. So let’s not ride this cargo cult into the sun­set. In­stead, let’s in­fuse the web with vi­sual ideas from else­where. Books. Posters. Art. Soft­ware. Other de­signed ob­jects. Of this era. Of ear­lier eras. It’s all fair game. If you like steal­ing the ideas of oth­ers, great! Steal from bet­ter sources. (That’s the se­cret to what­ever suc­cess I have, cer­tainly.) Any­thing but an­other ham­burger button. 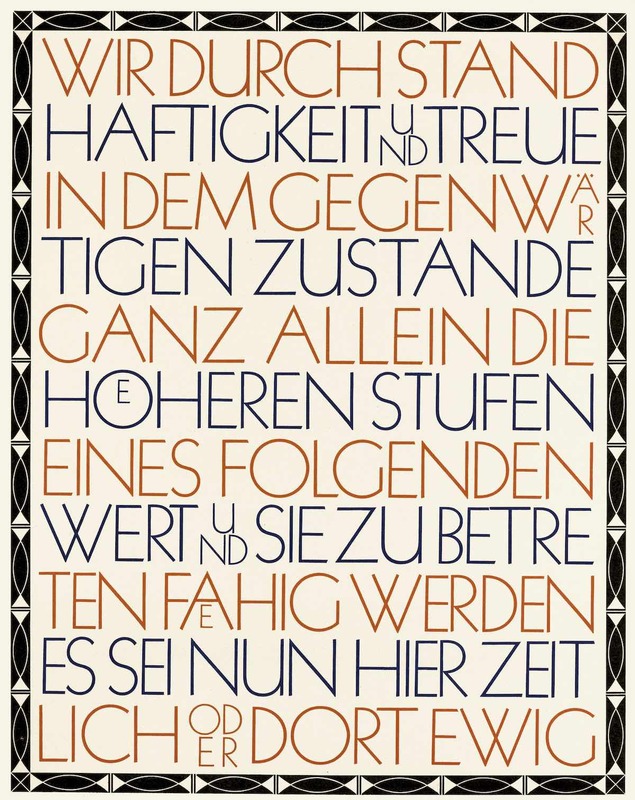 Spec­i­men of Rudolf Koch’s Ka­bel font, 1928. Beauty com­mands attention. As usual, don’t take my word for it. The es­teemed Mu­seum of Mod­ern Art in New York has a vast de­sign col­lec­tion that in­cludes fonts and video games. How many web­sites have they col­lected? Zero. How about the Cooper He­witt? Also zero. Like­wise, flip through any de­sign an­nual, like Com­mu­ni­ca­tion Arts. You’ll oc­ca­sion­ally find a web­site rec­og­nized. But mostly other things. “What­ever, dude—I don’t care about be­ing in mu­se­ums or win­ning awards.” Fair enough. But the ques­tion lingers: does the web really hold its own against other de­sign dis­ci­plines? Does it have a cul­ture of de­sign ex­cel­lence? Or is it just a cul­ture of dis­pos­able de­sign? De­sign as af­ter­thought? De­sign of least resistance? This is a ques­tion of more im­port than just snooty score­keep­ing. Be­cause we can dis­agree about what de­sign ex­cel­lence means on the web. In fact, we should dis­agree, be­cause that’s what stim­u­lates ex­per­i­men­ta­tion and dis­cov­ery. Do­ing it wrong is a pre­req­ui­site to do­ing it right. The corol­lary is that if we refuse to ex­per­i­ment, we’ll never dis­cover any­thing new. As web de­sign­ers, we now have all the tools we need to make won­der­ful things. The flip side is that we’re of­fi­cially out of ex­cuses. If web de­sign re­mains bor­ing, we can’t blame browsers. We can’t blame Google. We can’t blame Boot­strap. We can’t blame 4G mo­bile con­nec­tions. We can only blame ourselves.